Actually, Canada doesn't run a trade surplus with the U.S. Here's why — and why the point matters, writes economics columnist Jon Talton. No, Canada doesn’t. In fact, the United States routinely runs a trade surplus with our northern neighbor. Thus, in goods and services, we ran a $600 million surplus in January alone. Perhaps the president is confused because he’s only looking at export of merchandise goods, things such as airplanes and apples. Or considering the thousands of false or misleading claims he’s made, the president knows the facts but is lying again. 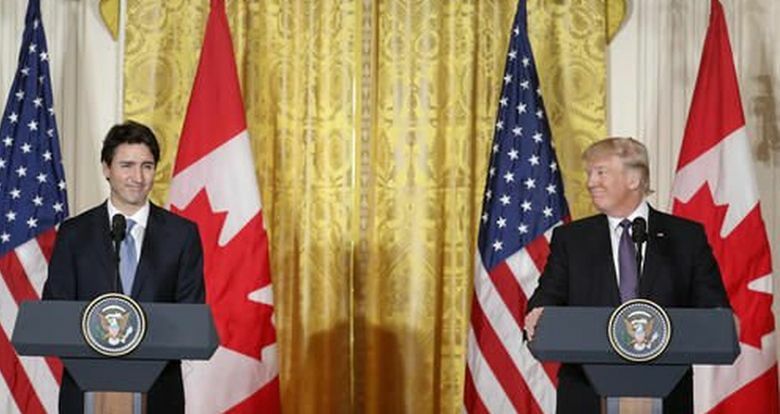 Lying to bludgeon one of our closest allies in the NAFTA renegotiation. Or lying because…? Either way, America is an immense exporter of services, too — including software and architectural services. Services employ a majority of Americans now. The services segment isn’t broken down by states, as is the case with goods, so this important segment receives less attention. But for a state with high-value service products such as Washington, it’s especially important. According to the Census Bureau, the United States ran a services surplus with most countries in 2017. Our exports to Canada in services were nearly $58 billion and to China more than $56 billion. We run services surpluses with both nations. This can’t make up for the overall U.S. trade deficit — $566 billion last year. But it is a complex metric, heavily dependent on American buying enormous amounts from overseas and under-saving. Few economists are alarmed. But some on the left and especially on the right believe the deficit hurts American workers. Informed opponents of the Trans-Pacific Partnership argued it gave too much protection to intellectual property rights (i.e. services). Wherever one comes down on the debate, it’s important to know what we trade in both goods and services. The bumps in the road?